While some Chicagoans (and some in the leadership of the Chicago Teachers Union) try to blame the latest round of segregative school construction on Chicago Public Schools CEO Forrest Claypool and the current mayor, Rahm Emanuel, as Substance has been reporting for 45 years, the intense racial segregation of Chicago -- which is mainly devoted to maintaining the segregation of the city's African American families and school children -- has been going on at great expense for a century. Chicago's schools may be either "broke" or (to quote the Chicago Teachers Union) "Broke on Purpose," but as it has for nearly a century, Chicago can always find dollars to sustain or expand racial segregation, Chicago style. The centuries may change, but the game (the maximum racial isolation of black people in Chicago and black children in Chicago's schools) remains the same as always. Corporate school "reform" in Chicago replaced pre-reform school planning, but the plans to sustain or expand Chicago-style segregation -- in Chicago, that means the maximum racial isolation of African American children -- continue into 2017 as the Chicago Board of Education moves to spend at least a quarter billion dollars on new segregated high schools. But as we've reported previously in Substance during our 45 years of publication, this is nothing new. 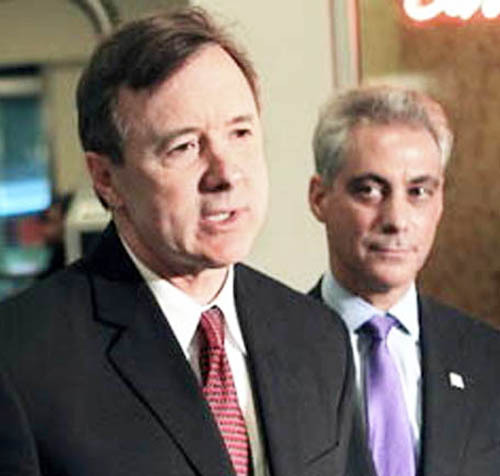 Take, for example, the story we published in 2009 about how the use of the term "failing school" weaponized Chicago officials under then mayor Richard M. Daley to expand so-called "turnaround" under AUSL (the Academy for Urban School Leadership) and Daley's friends including AUSL chief Martin Koldyke. The push to spend scarce CPS capital dollars to build new segregated high schools is nothing new in Chicago, which has been building schools to preserve or expand segregation for nearly 100 years as of this year (the earliest segregation policies were put into place after World War I following the "riots" of 1919). During those 100 years, Chicago has sustained the most segregated school system in the USA. And six years ago, Chicago was able to get out from under court monitoring so that CPS officials could expand segregation without any federal oversight. Note to readers: All this took place long before Donald Trump became the bete noir of "progressive." And a great deal of the most segregated construction took place during years when Chicago was dealing with supposedly progressive Democratic administrations in Washington. Here is the 2009 Substance article noting how by basing school evaluations on standardized tests, CPS was able to claim that a huge number of black schools were "failing" and therefore should be subjected to so-called "turnaround." Officials of the Chicago Public Schools have quietly made public a list of 42 elementary schools that they say could have been targeted for so-called "turnaround" this school year. In addition, Substance has learned that the majority of the remaining general high schools in Chicago (schools that serve the general populations, anybody who walks in the door and lives in the community) also meet most of the "criteria" for "turnaround." [img=284]Under CPS guidelines, "turnaround" is actually the process known to the rest of the nation as "reconstitution." Under "reconstitution" the entire staff of a supposedly "failing" school is fired, and a new staff, supposedly trained in better teaching methods, is brought in to replace those who have "failed." What has not been noted in the carefully scripted hearings aimed at condemning the teachers and other staff at the schools on trial this year for failure is that two federal laws governing how schools and children are supposed to be treated are being carefully ignored as Chicago goes through its annual ritual of reconstitutions. The laws? The first are federal desegregation laws that go back to the famous 1954 case in Brown v. Board of Education. The second are federal laws and court decisions governing the treatment of students with disabilities. In Chicago, both are governed by federal consent decrees, both of which are still being monitored by federal judges. The desegregation consent decree governing Chicago was put into place in 1980 after Chicago mayors tried for more than 20 years to claim the city hadn't segregated itself or its public schools. The special education consent decree, under the federal Individuals with Disabilities Education Act (IDEA) has been in place since the mid-1990s under the "Corey H" decision. The federal desegregation consent decree is currently being monitored by U.S. District Judge Charles Kocoras. The Corey H consent decree is being overseen by U.S. District Judge Charles Gettleman. Despite the long list of legal precedents cited by CPS officials at each of the hearings calling for the reconstitution of the schools, neither federal law or consent decree is noted, either by CPS officials or the hearing officers who are hearing the cases. In the view of many observers, this is not an accident. Instead of being examples of the failures of the teachers, parents, principals and students at the schools targeted this year for reconstitution, the schools -- and dozens of others -- are examples of the fact that Chicago remains the nation's most viciously segregated city. [img=285]Also, Chicago has systematically deprived children with disabilities of their right to public education in the least restrictive environment. As long as CPS officials and their hearings officers are allowed to ignore federal law, the current reality will continue. The list of elementary schools that have "failed" according to this year's CPS criteria includes two schools -- the so-called "Sherman School of Excellence" and the so-called "Harvard School of Excellence" -- that are currently managed by the "Academy for Urban School Leadership" (AUSL). AUSL is currently slated to receive more schools for "turnaround" after hearings that are taking place this month and a vote by the Chicago Board of Education on February 25. The full article will be available in the print issue of Substance. Forty-two elementary schools could have faced 'turnaround'. Five do. This school year, five Chicago public elementary schools have been targeted for reconstitution (which in Chicago is termed 'turnaround' using the corporate jargon currently in vogue. All five of those schools meet what CPS officials call the 'turnaround criteria' based on low test scores. But the five schools -- and the remaining 37 schools on the list that CPS officials say could have been targeted for 'turnaround' -- meet another criteria as well. All of them are located in the heart of Chicago's ruthlessly segregated ghettos. All of the students at the majority of the schools are African American. The vast majority of those students have been living in heart breaking poverty since long before the current economic crisis hit the middle classes and the wealthy. And the majority of the teachers who teach in those schools are viewed in the community as sources of stability and continuity that does not exist in most other parts of the lives of these children, all of whom are victims of the most segregated city in the United States of America -- Chicago. [img=287]Thirty years ago, the existence of these schools -- and their problems scoring well on so-called 'standardized' tests -- would have been utilized as evidence that Chicago segregates its public schools in violation of the U.S. Supreme Court decision in Brown v. Board of Education. That decision ruled that racial segregation in public schools was inherently unequal. But in 2009 in Chicago, the problems faced by these same schools are considered -- in the eyes of those who run CPS -- as proof that the teachers and other staff at the schools should be fired and replaced with teachers who are supposedly experts in new methods of teaching and can, in the jargon of corporate Chicago, 'turnaround' the schools. The following is the list of the 42 Chicago elementary schools that could have been subjected to reconstitution this school year under the three criteria outlined by the Chicago Board of Education's Chief Executive Officer during the early February hearings on the proposed reconstitution (known locally as 'turnaround') of Bethune, Dulles, Holmes, Johnson and Yale elementary schools. All of the schools are located in the heart of the city's vast south side and west side segregated black ghettos or on the border with a nearby Latino barrio. [img=286]The list below includes each school's name, followed by the address (in parenthesis), followed by the total number of students attending the school this school year, followed by the percentage of students who are African-American. 1. Bass (1140 W. 66th St. 60621); 508 total students; 99.8 percent African American students. 2. Bethune (3030 W. Arthington 60612); 353 total students; 99.4 percent African American. 3. Bontemps (1241 W. 58th St. 60636); 393 total students; 98.7 percent African-American. 4. Bradwell (7736 S. Burnham 60649); 770 students; 99.9 percent African American. 8. Doolittle (535 E. 35th St. 60616); 431 students; 99.1 percent African American. 9. Dulles (6311 S. Calumet 60637); 429 students; 99.8 percent African American. 10. Dumas (6650 S. Ellis 60637); 382 students; 99 percent African American. 11. Earle (6121 S. Hermitage 60636); 394 students; 100 percent African American. 14. Fulton (5300 S. Hermitage 60609); 654 students; 82.3 percent African American; 17.5 percent Hispanic American. 16. Henderson (5650 S. Wolcott 60636); 461 students; 98.7 percent African American. 17. Hinton 644 W. 71st St. 60621 421 99 percent African-American. 18. Holmes (955 W. Garfield Blvd. 60621); 462 students; 99.6 99 percent African-American. 19. Howe (720 N. Lorel 60644); 540 students; 99.4 99 percent African-American. 20. Johnson (1420 S. Albany 60623) 281 students; 99.3 99 percent African-American. 21. Kershaw (6450 S. Lowe 60621); 273 students; 98.9 99 percent African-American. 22. Key (517 N. Parkside 60644); 389 students; 98.5 99 percent African-American. 23. Lathrop (1440 S. Christiana 60623); 322 99.1 99 percent African-American. 24. Lavizzo (138 W. 109th St. 60628); 506 students; 98.6 99 percent African-American. 25. Lewis (1431 N. Leamington 60651); 813 students; 86.1 99 percent African-American; 13.5 percent Latino (110 students who are minorities but are not black). 26. Libby (5300 S. Loomis 60609); 569 students; 92.8 99 percent African-American; 7.2 percent students who are Latino (41 students who are minorities but not black). 27. May (512 S. Lavergne 60644); 588 students; 98.8 99 percent African-American. 28. McKay (6901 S. Fairfield 60629); 1,052 students; 89 99 percent African-American; 11.1 percent Latino (116 students who are minorities but not black). 29. Medill (1301 W. 14th St. 60608); 147 students; 100 99 percent African-American. 30. Morton (431 N. Troy 60612); 284 students; 94.7 99 percent African-American. 31. Nash (4837 W. Erie 60644); 584 students; 99.1 99 percent African-American. [img=288]32. O'Keefe (6940 S. Merrill 60649); 675 students; 100 99 percent African-American. 33. Park Manor (7037 S. Rhodes 60637); 378 students; 99.7 99 percent African-American. 34. Parkman (245 W. 51st St. 60609); 156 students; 87.8 99 percent African-American; 11.5 percent other minorities (18 students this school year). 35. Reed (6350 S. Stewart 60621); 297 students; 100 99 percent African-American. 36. Ross (6059 S. Wabash 60637); 411 students; 100 99 percent African-American. 37. Schiller (640 W. Scott 60610); 190 students; 99.5 99 percent African-American. 38. Sherman (1000 W. 52nd St. 60609); 584 students; 99.1 99 percent African-American. 39. Smyth (1059 W. 13th St, 60608); 592 students; 98 99 percent African-American. 40. Wentworth (6950 S. Sangamon 60621); 427 students; 98.6 99 percent African-American. 41. West Pullman (11941 S. Parnell 60628); 424 99.5 99 percent African-American. 42. Yale (7025 S. Princeton 60621); 294 students; 99.7 99 percent African-American. List of Schools: Provided to Substance by Department of Research, Evaluation and Accountability February 6, 2009 (not available on the CPS website; request fulfilled under the Freedom of Information Act by Ginger Reynolds, Office of Research, Evaluation and Accountability, Chicago Public Schools.